VCU showed great fight in a battle for a trip to the Sweet 16, but in the end would come up just short, 85-81 to the 2-Seeded Oklahoma Sooners. In what was basically a true road game, VCU opened behind a JeQuan Lewis layup. Melvin Johnson hit his only three pointer of the first half to give the Rams a 5-4 lead. Oklahoma would then use a 17-2 run to pull away from the Rams. 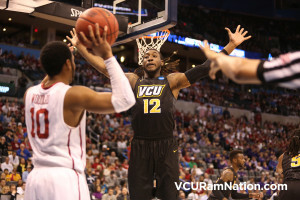 A VCU steal lead to a Michael Gilmore dunk and started a 7-0 run for the Rams. Buddy Hield would sit the final 4:26 of the first half, but the Sooners used a 12-4 run in his absence to take a 13 point lead into the locker room. The second half started with back-to-back three’s for Johnson, and the Rams used two separate runs of 7-0 and 8-0 to claw back into the game. Michael Gilmore provided an incredible second half and hit back-to-back three’s to give the Rams a 62-61 lead. Gilmore would end the night with 12 points and 7 rebounds. JeQuan Lewis (20 points, 4 rebounds, and 9 assist), Melvin Johnson (23 points, 3 rebounds, and Mo Alie-Cox (10 points, 4 rebounds) would all score double-digits for VCU. In the end, Buddy Hield would prove too much for the Rams. Hield would end the night with 36 points and 7 rebounds, with 29 of those points coming in the second half. VCU ends the season with a 25-11 record overall and a share of the A10 regular season. I am a VCU alum as well as a fan……I like WW but he did not do a very good job coaching on Sunday. I have NEVER understood why coaches(all levels) SIT players……..but then again…..I played a year of college basketball and remember when we were in a couple of close games and the “coach” would not put me in……so I KNOW it is “personal” versus a “match up” deal…..more often than not. Sad to see the guys working their butts off….only to be misguided. Will Wade did a fantastic job this year!!! Only came up 4 points shy against a top 10 team that could possibly win the national championship. It was a home game for Oklahoma. We played in two tourney games this year. Texas did not!! Gonna be even better next year!